"...just to spread the story of the Palestinians that there was and still is injustice against them [is an act of support]." Historically, the black and white kufiyeh, or hatta, was the popular headdress of the peasants, thus also signifying lower social status and a rural background. In 1936, the peasants led the armed Palestinian resistance against British colonialism and its support of Zionism. In solidarity with the rebels, and to make it more difficult for the British to spot them, Palestinian townsmen started wearing the kufiyeh also. 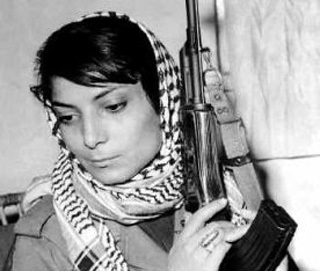 In the 60’s, the scarf became emblematic of the nascent Palestinian national movement - it was the favored headwear of the Palestinian leader Yasser Arafat and other symbols of the Palestinian resistance such as Leila Khaled. Leftist parties used a red-and-white version to differentiate themselves within the wider nationalist movement.